It’s no secret that I’m a fan of Dyson products… Whether it’s our upright floor vacuum, handheld vacuum, cordless hard floor vacuum or our air multiplier, we use their products pretty much daily. So I was super excited when they contacted me to ask if I was interested in testing out their newly released Dyson Cool fan. 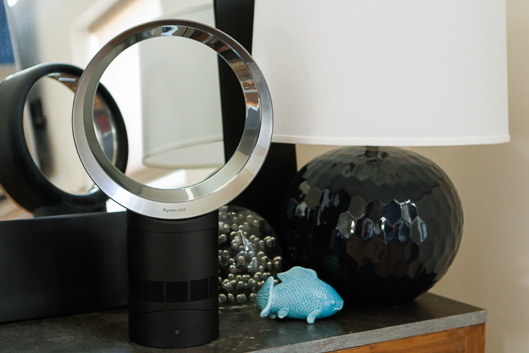 I reviewed the original Dyson Air Multiplier Fan about four years ago, and it’s still running strong to this day. I honestly didn’t think there was much that Dyson could improve on the original model, but boy did they prove me wrong! 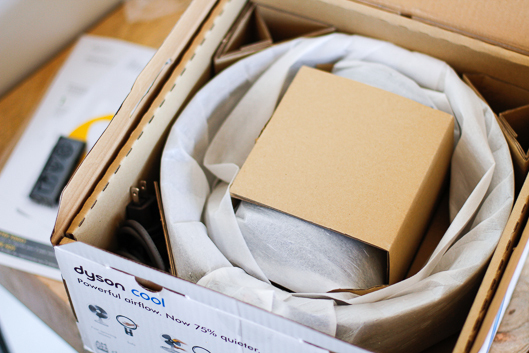 The new Dyson Cool arrives in a surprisingly compact little box. You simply snap the base and the fan head pieces together and it’s ready for use. No blades — I learned the hard way when I was younger that kids and traditional fans do not mix, so we’ve never used them around our kids. 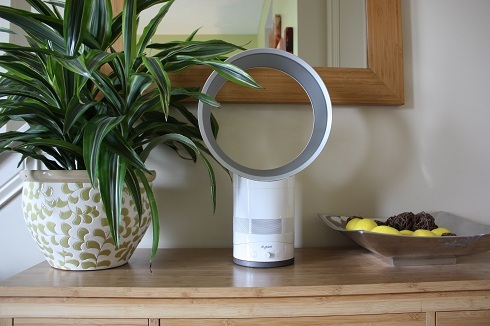 The Air Multiplier technology that Dyson employs in their fans is ultra-safe for families with young children. 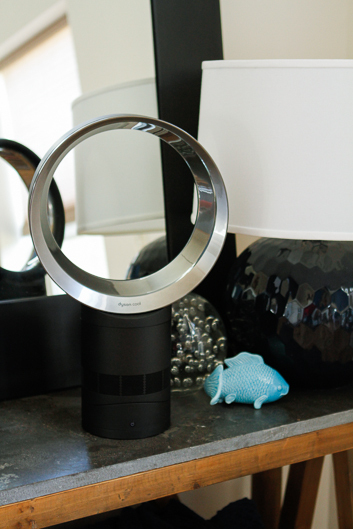 Easy to clean — In addition to being safer, the bladeless system makes the Dyson fans quick and easy to clean. Just a quick swipe with a microfiber cloth is all you need to remove any dust. Touch-tilt feature — This simple feature makes directing the air flow simple and easy, unlike trying to direct a box fan. So what’s new and impressive about the Dyson Cool? Remote control — The dimmer switch feature on the original fan has been replaced with a remote control that easily allows you to quickly select from 10 precise air flow settings. I love that Dyson went the extra mile in making it magnetic, so it can easily be stored right on the fan itself (because remote controls have legs around here). Sleep timer — The sleep timer allows you to program the fan to turn off after pre-set intervals ranging from 15 minutes to 9 hours. 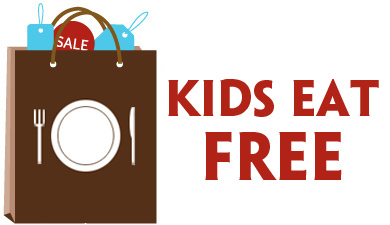 This is such a smart addition, especially for busy, scatterbrained moms like me! Quieter — My old Dyson fan was pretty quiet compared to a box fan, but Dyson has improved the noise level on the new Dyson Cool fans to be 75% quieter than the original. I know some of you like your white noise, but for me, this is nothing short of amazing because I sleep best in dead silence, probably because my house is never quiet during the day. So would I recommend the Dyson Cool? Absolutely! Although, with prices starting at $299, I get that it may be a bit of a stretch for some of your budgets, it’s definitely worth the investment. 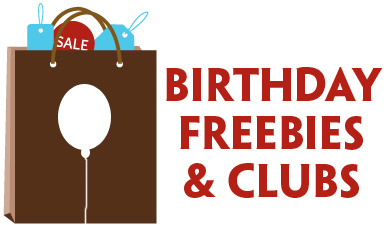 As I mentioned, our original is still in fantastic working order, so they’re definitely a quality product that you can count on using for many years to come. If you’re interested in staying up to date on new Dyson technology, follow them on Facebook and Twitter! This is a sponsored conversation written by me on behalf of Dyson. The opinions and text are all mine.